"Being 'of a certain age’, I remember the sound of gigantic iron wheels slipping on the track, or the slow acceleration of puffing steam as a train left a station, and the immense power of a passenger express going past at full steam. "Growing up in Enfield, Middlesex, trains were all around and a part of daily life. My father led the orchestra-in-residence at the Palace Hotel in Southend-on-Sea and my holidays were spent there after a journey from Enfield Town to Seven Sisters, there alighting to walk across the road to South Tottenham Station, from whence we joined the train from St Pancras via Walthamstow, Barking, Tilbury and eventually to our destination at Southend Central. All of this journey done sitting in a lovely warm carriage with the hubbub of London in the 50s passing by my wide eyes as the smoke and sparks flew by the window. "I was reminded of the ’aroma’ of those days of steam when I visited the Watercress Line in Hampshire recently and realised that the pollution in urban areas then was a part of life, and getting from home to your Auntie’s house was just a couple of stops and a short, safe walk for a six year-old. 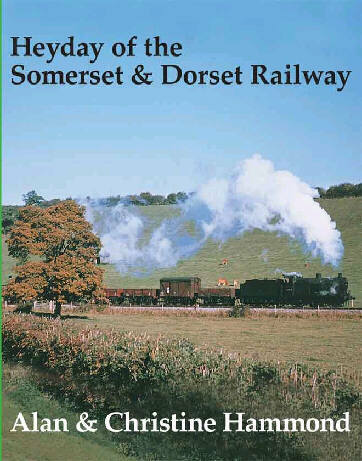 I collected the names and numbers of the locomotives that I saw, as did most kids then – all the locos seemed to be black or green – I never saw a blue one like the early Somerset & Dorset! "My last memory of a steam-train journey was a holiday in Cornwall when I was twelve years old and the line went along the seashore at Dawlish in Devon. I saw palm trees, the sandy beach, and people paddling with knotted handkerchiefs on their heads (perhaps 1957 was a hot summer!). And then I discovered Rock and Roll – music took over and the railways disappeared. "I count myself lucky to have grown up in the 50s and 60s, an era when children were left to play games in the parks and streets, and nothing was taken for granted, not even the wondrous design and engineering of the railways of Great Britain. Oh yes – and of course – there was Elvis Presley!"